Words cannot describe how honored I feel that Kevin and Bry flew me to Minnesota to photograph their engagement photos last week!! What an exciting trip! I had never been to Minnesota before so I was beyond pumped to visit a new state, fly on a plane again, and have an adventure. While I was there I kept thinking how there were no other states above me, just a whole other country!! I was geeking out just a tad. My first impressions of Minnesota were that it’s colder than Virginia, super flat, you can definitely hear that northern Minnesota accent, and the people were incredibly friendly!! A week prior to flying out, Bry and I talked about outfits and engagement session locations. She sent me photos of her and Kevin’s outfit to get a second opinion and to see if I thought they looked cohesive. She also wanted to know what I thought about her engagement session location. Let me tell you, it was perfect!! I love when clients put this much thought and effort into their outfits and locations (if they have a special location in mind). Engagement photos aren’t just photos. You’re truly capturing memories and moments in time. Your engagement is such a special season in your life. 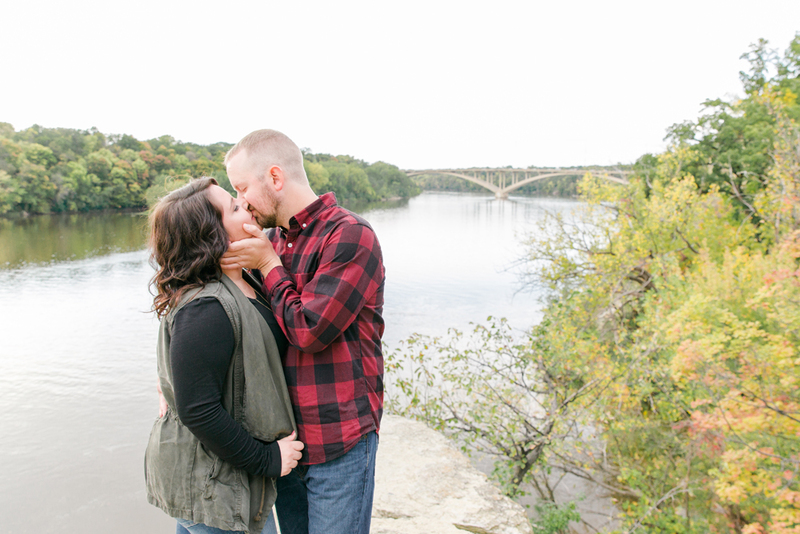 We went to Shadow Falls Park in St. Paul for their engagement session. Kevin and Bry had been there before and loved that it overlooked the Mississippi River. They both love fishing so we had to include water! It was the perfect choice. Bryanna’s Hair and Makeup was done by Katie Kebernik located in Elk River. Contact Katie at [email protected] or 763-923-9338.